Aaron T. Novasic is an associate attorney at the law firm of Goldstein Bender & Romanoff. Aaron concentrates his practice on injury cases arising from car accidents, truck accidents, premises liability actions, dram shop actions, medical malpractice, construction accidents, defective medical products, products liability, nursing home injuries, and an assortment of other types of negligence. Aaron received his Juris Doctor from The John Marshall Law School. While in law school, Aaron actively practiced law pursuant to Illinois Supreme Court Rule 711, and was admitted into the Central District of Illinois. 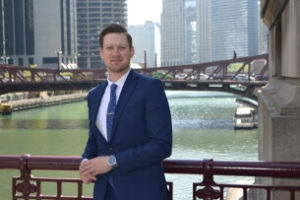 Aaron also clerked for two plaintiff personal injury firms located in Chicago where he obtained substantial experience in personal injury law. Aaron also spent three years working Pro Bono, tirelessly prosecuting federal civil right cases on behalf of those without the means to obtain counsel. During this time, Aaron tried and settled cases with the Illinois Attorney General. Aaron received his undergraduate degree in Political Science from Dominican University in River Forest, Illinois. While in college, Aaron interned at the Racine County District Attorney’s Office in Racine Wisconsin. Additionally, Aaron was a NCAA Scholar Athlete Award Recipient. He earned this award as a captain of the golf team and member of the basketball team. In his free time, Aaron enjoys golf, playing with his dog Thor, repurposing furniture, wood crafting, Muay Thai kickboxing, and volunteering as a teacher of self defense techniques. Aaron is licensed to practice law in the State of Illinois. He is a member of the Chicago Bar Association, Illinois State Bar Association, and American Association for Justice.